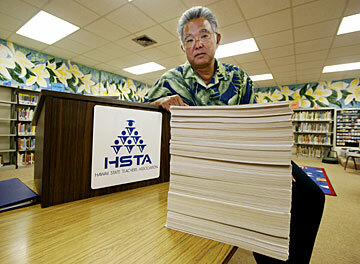 HSTA President Roger Takabayashi stood behind a stack of new report cards yesterday that he said a typical high school teacher would have to fill out during the school year. Schools Superintendent Pat Hamamoto yesterday promised to swiftly address questions about a new elementary school report card format, which the teacher's union says is confusing and too cumbersome to fill out. She said the Department of Education would consider halting implementation at individual schools if necessary, but said it could not halt it statewide, as the union wants. "Many have completed the report cards for the first quarter and we need to honor those who got through it successfully and are looking forward," she said. Hamamoto said the department is gathering feedback from schools and that some adjustments could be implemented in time for second-quarter grades in a couple of months. "We need to assess what we can readily resolve and what will take more time to work out," she said. Earlier, the Hawaii State Teachers Association said the new four-section grade reports, which have been in the works for several years, deserve an "F."
Though it supports the need for new report cards, the union says the new version takes teachers more than twice as long to complete and there has been little or no support or training from the department. "Instead of an effective instrument that is easy to use and understand, Hawaii's elementary teachers are struggling with a cumbersome, physically challenging and time-consuming document that fails to clearly show how students are performing," HSTA President Roger Takabayashi said. The state moved several years ago to what is known as a standards-based education system, but hasn't adjusted report cards until now. Besides a new system of letter grades, it requires more detail on student progress and puts a greater burden on teachers to determine a student's grade, previously based on an average of homework and test grades. Ann Nakayama, a second-grade teacher at Aina Haina Elementary, said the report cards are good in the long run, but that more help from the department should have been forthcoming. Still, she doesn't favor halting implementation. "We'd like to see it through this school year and maybe make some changes next year, but not just change direction in midstream," she said. Sixth-grade teacher Anne Marie Ho of Waimanalo Elementary said she could complete four of the previous report cards in an hour, but now needs three hours to do just one. "It's not just a check mark any more -- it's a narrative," she said, while adding, "change is difficult. In five years, we'll be much better at it." Takabayashi expressed the union's concerns to the Board of Education last night. However, Assistant Superintendent Kathy Kawaguchi countered that many key recommendations were indeed adopted, such as reducing the number of letter grades to four from the original five, and adjusting them for clarity. She also said there was plenty of time in the past for the union to speak up. "It's not like this whole thing has been shrouded in mystery. All of this was shared with teachers and others involved," she said. "But as we roll this out, we will learn and make improvements." Some parents fear problems later in applying to private schools that might find the Department of Education grades unintelligible, but leading private schools don't expect a problem. "The DOE has their reasons for doing things and the rest of us just have to adjust. It's not insurmountable," said Scott Siegfried, director of admissions at Maryknoll School.